Theodor Adorno's Aesthetic Theory (1970) offers one of the most powerful and comprehensive critiques of art and of the discipline of aesthetics ever written. The work offers a deeply critical engagement with the history and philosophy of aesthetics and with the traditions of European art through the middle of the 20th century. It is coupled with ambitious claims about what aesthetic theory ought to be. But the cultural horizon of Adorno's Aesthetic Theory was the world of high modernism, and much has happened since then both in theory and in practice. 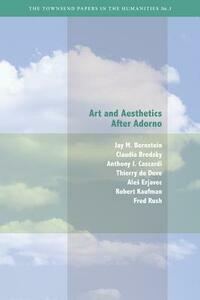 Adorno's powerful vision of aesthetics calls for reconsideration in this light. Must his work be defended, updated, resisted, or simply left behind? This volume gathers new essays by leading philosophers, critics, and theorists writing in the wake of Adorno in order to address these questions. 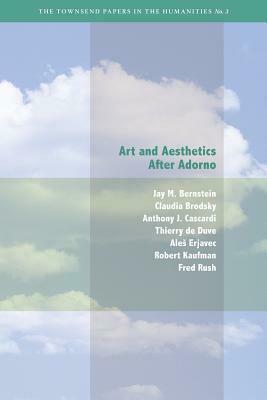 They hold in common a deep respect for the power of Adorno's aesthetic critique and a concern for the future of aesthetic theory in response to recent developments in aesthetics and its contexts.